I have been holding onto this word about the “Spiritual Power Suits” for a while. It just never seemed like the right time to publish it. I am still learning the timing of things and tracking how I hear from God…a training season. 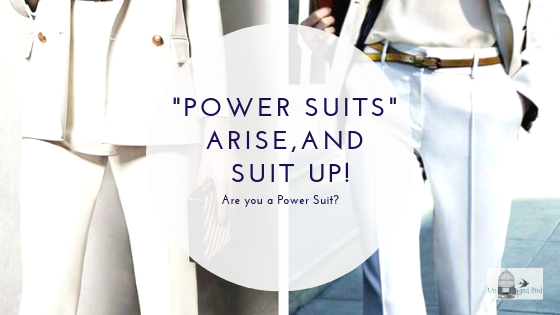 So, here is the word about the “power suits” and the elevation of women that Holy Spirit dropped on me last year. It’s certainly the right time to publish it. And, it’s certainly an exciting time for women. I encourage you to check out other words published by tested and well-known prophets and leaders about women rising to the place God intended. It’s remarkable what God is doing in this new era. The morning of New Year’s day 2018 is where this word begins. I was watching one of the mainstream media news (like I did quite often). This particular morning they began discussing the fashion trends for 2018, which is not especially interesting to me. It’s not that I am fashion-backward but more that I am not focused on being fashion forward either. However, that morning was different. Lara Spencer begins the segment announcing that this year’s fashion trend is “all about suiting up…The power suit is back and better than ever.” That’s when I heard in my spirit, “pay attention to the power suit.” Now the segment grabbed my attention. Three models showcased the trend for the year. As they each walked out on the stage, the Lord spoke to me about each one they introduced. The first model came out in a pure white, pants suit. The jacket wore like a cape. Lara Spencer commented on how wearing that type of jacket makes you feel like a superhero. Now, the show REALLY has my attention. I sense God was about to download something powerful. I continued to watch. The next two trends were royal blue and bold pattern suits. What is the power suit? For those of us who experienced the 80’s, the power suit was a fashion trend, characterized by sharp cuts, wide shoulder pads, and a stiff rigidity, notably worn by women in business and politics. But, it was more than fashion, it was a symbol of power and influence. “Power dressing” was significant for working women in society at the time and was pivotal in bringing to the public the visibility of women in high powered job positions. Another definition of a power suit is “a powered exoskeleton” is a wearable suit that works in tandem with the user and allows for dexterity with increased strength and endurance. I feel God will continue to unpack this word over time, but right now I see God confirming the rise of women in powerful and influential positions. He is elevating those who walk in righteousness across all seven mountains of culture. They will carry divine authority and revelation with boldness. Their influence will bring about impactful change. The Lord is covering them with “spiritual power suits” of influence, righteousness, power, and purity of heart to elevate them to places of authority in their spheres of influence. He will place boldness in their hearts to accomplish kingdom goals. God is giving those who walk in righteousness the keys to reach and influence places of power and responsibility. The “power suits” will carry with them a reputation of integrity and pureness of heart. They are highly trusted and respected. God will raise them to higher levels of influence and power. These are reformer men and women and “mountain climbers.” There will be many who will applaud this move of women into influential positions, but there will also be pushback. God will reveal to the hearts of many where the Spirit of the Lord has not yet transformed mindsets. I believe the Lord will expose hidden spirits of sexism and discrimination toward women. He is opening up the opportunity for change in the hearts of men under these mindsets. Again, I don’t believe God is exclusive when He moves. Many women walk around with discriminatory thought patterns against men as well. The King of Glory desires the unity of men and women. To do that, He will need to address and reform ALL hearts. With this God move, the enemy will also rise. The strategy of the enemy will be to whisper into the ears of men and women. He will say to them that this is a radical feminist movement that seeks to elevate women above men. However, that is not what God is doing. I believe He is resorting His original design for women and men on earth. Satan’s goal is to bring further division among the sexes instead of the unity God is manifesting. The enemy will use many methods, such as radical feminism agendas, to appr God’s plans. He will attempt to accelerate the lie that the purpose of women being highlighted and elevated is to Lord over men. Rember, God’s plan is unity, not division or control. God’s desire for elevating women is not to overpower the role of the man. It is to work beside each other as equals, yet with distinctly different talents that are needed to bring about His purposes. I hear the word TEAM as I think about what He is saying. In a team, there is a leader. However, all members of the group lean on each other’s strengths and work in unison to achieve success. The Bible is full of powerful women who brought change and victory for God. As a side note, we must be careful to think that God’s power suits are the “pastoral” type. I don’t believe this is how it will operate. I believe these people will be Christ followers, but not necessarily the ones who shout it from the podium. You will know them by their fruit. Their life will be the example. 1. Pray it in. We need to partner with God to usher in the purpose of God regarding the power suits. 2. Protect the Gates. Pinpoint prayer to halt the enemy at the gates seeking to steal the move of God. The only way the enemy can cause a ruckus is to make people believe it’s a “hostile takeover” of feminist militancy. Pray that God’s truth about the “spiritual power suits” takes center stage and not the enemy’s plans. 3. Heart Reformation. Many sexist mindsets exist today within men AND women. Some of those are deeply rooted and in some cases unknowingly hidden within us. Pray that God reveals areas that men and women harbor discriminatory thoughts and feelings. Pray that He convicts their hearts so they can partner with Him to bring unity. Lord Jesus, I come before you as Your humble servant. Thank you for Your grace and mercy. You are such a loving and faithful God. Let all who have breath praise Your Holy Name. Thank you, Father, for elevating your “Spiritual Power Suits” to places of position influence for your Glory. I say rise “Power Suits.” I pray divine protection and divine favor over those clothed in boldness and authority to carry righteousness into the mountains of influence. Guide them in all their ways so that they may do the work of your Kingdom. Jesus, I call upon your beautiful name to place angels at the gates of influence. Let Your plans and purposes take center stage in our hearts and minds. Anoint the eyes and ears of our heart to discern between Your Truth and the enemy’s lies so that we can see what YOU are doing and not focus on the enemy. Father, I speak reform over our hearts. Reveal any mindsets within me that harbor sexism or discrimination against men or women. Jesus, pluck it from my soul and create in me a clean heart. I rebuke the lie that this a “hostile takeover” of women and radical feminist ideology. I declare and decree unity amongst men and women. Heavenly Father, I pray with expectancy and partner with You Lord that Your plans and purposes be done on earth as they are in heaven. In Jesus name, Amen.